Background: Laparoscopic suprapubic hernia repair (LSHR) is technically challenging, requiring difficult, dissection in the superior pelvis. Obesity creates an added complexity to the repair itself, and to the complications and recurrences that may develop. Methods: We retrospectively reviewed 22 overweight and obese patients who underwent LSHR by one surgeon between the years of 2005 to 2007. Patient demographics, comorbidities, defect size, mesh size, complications and recurrences were included in the database. Results: Twenty patients were female and two were male, with a mean age of 49.5 years and an average BMI of 37.5 (SD±6.65). Patients averaged 4.1 (SD±2.5) previous abdominal operations, with 55% (n=11) having a previous Caesarean section. Median defect size was 195 cm2 (Range 24-544 cm2), and median mesh size was 600 cm2 (Range 300-1196 cm2). Median operating time was 147 minutes (Range 53-379 minutes). Average length of stay was five days, and average follow-up was 3.5 months (SD±3.9). Seven (31.8%) complications were noted. These included enterotomy (n=1) with associated delayed mesh placement, pain lasting longer than six months (n=2), mesh infection (n=1), symptomatic seroma (n=1), postoperative renal failure (n=1), and small bowel obstruction secondary to interstitial hernia (n=1). 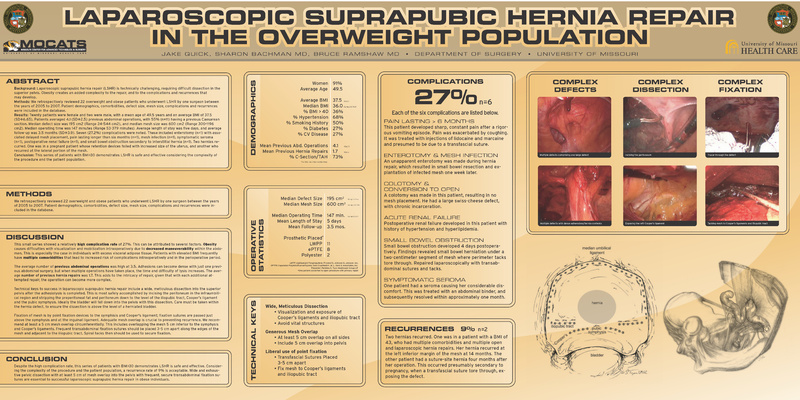 Two hernias recurred. One was in a pregnant patient whose retention devices failed expectedly, and another who recurred at the lateral portion of the mesh. Discussion: The complication rate of 32% in these challenging patients is quite high. We attribute this to multiple factors. Often, these patients present with numerous previous operations, which necessitate complex and extensive lysis of adhesions. Patients with elevated BMI frequently have comorbidities which complicate the perioperative course as well as cause intraoperative difficulties with visualization and mobilization. The technical keys to success are determined by wide pelvic dissection and adequate mesh overlap into the pelvis with frequent, secure transabdominal fixation sutures. Conclusion: This series of patients with BMI>30 demonstrates LSHR is safe and effective considering the complexity of the procedure and the patient population.